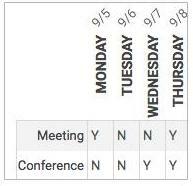 You can now rotate the text in a cell in Sheets (Format > Text rotation). This is especially useful when you need to fit long header names into thin columns, or when you simply want to fit more text on a single screen. We’re making it easier to read your budgets, expense reports, and other spreadsheets containing monetary amounts by aligning the currency symbols within them (Format > Number > Accounting). We’re also making improvements to the way numbers, decimal points, and repeated characters line up to make them simpler to scan and analyze. You can now choose from several new border styles in Sheets, including various thicknesses and double borders, which are commonly used in financial statements like balance sheets (Toolbar > Borders > Border styles). For more details, check out the Help Center articles below.